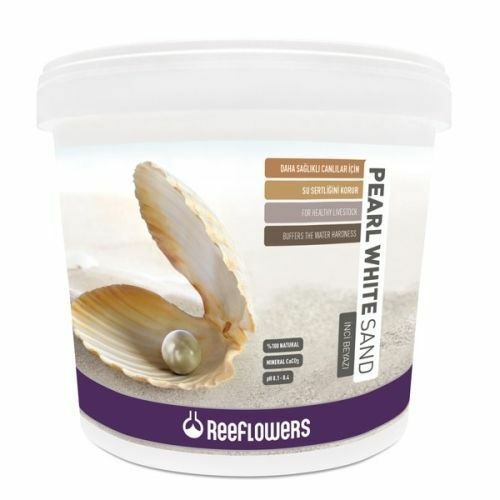 ReeFlowers Pearl White Sand is a natural, pure white sand containing calcium. It acts as a natural buffer to water hardness due to its calcium and carbonate content helping to create a natural environment for aquarium inhabitants. It may be used in saltwater aquariums, Tanganyika Lake aquariums, Malawi/Victoria Lake aquariums and other aquariums that require high pH values. When ReeFlowers Pearl White Sand is added to the aquarium water, some parts of it may dissolve helping to stabilize your aquarium's pH level between 8.1 - 8.4. This helps to create the optimum environment for nitrifying and denitrifying bacteria, helping to clean water.